Today I heard that my Wegener book is going to be translated into German by Dielmann Verlag. 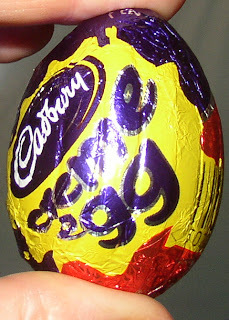 I have dreamt about this happening for a long time and am, of course, delighted. The publisher came across my work on the internet. Another good reason for blogging. Dates should generally contain commas unless you write it like this: 3oth April 2007, which Strunk and White recommends is the best way. So I shall do that in future. behemoth = huge, monstrous creature. pusillanimous = timid, cowardly. lily-livered. In the wake of the Francine Prose book many other books have come thumping through my letter-box, many of them only available from the U.S. 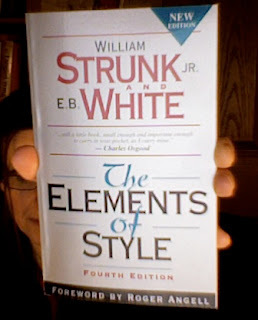 The Elements of Style by Strunk and White is one of these. I am going to endeavour to learn something from this every day in order to improve my style. Today I learnt that there is such a thing as a 'serial comma'. I didn't know this. It comes in a list of three or more terms with a single conjunction e.g. red, white, and blue. But not in the names of firms e.g. David, Foster and Wallace. Blink and you are there. 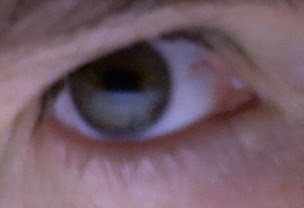 How I saw you last. Little accomplished today. 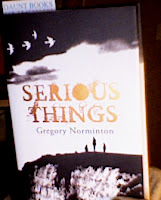 I read Norminton's SERIOUS THINGS then I had breakfast. I read SERIOUS THINGS and then answered the phone. I read SERIOUS THINGS and then went out to yoga. I read SERIOUS THINGS and then had lunch and wrote a few emails. ...And then I finished SERIOUS THINGS and felt bereft. Excellent book. The sort that grabs your mind with its sticky little fingers and pummels it even when you've managed to lay it down. I couldn't face my own work after this so I have left it for today. I am going to do some therapeutic ironing instead. Then, a few pages later, the reader is introduced to Mr. Bridge, who is a new arrival from an inner-city comprehensive and seems to flush out the miasma of the Wimbushes. Although not quite as charismatic or generally adored as the teacher John Keating in the DEAD POETS SOCIETY he also teaches English and swiftly inculcates a love of unconventional literature including RIDDLEY WALKER by Russell Hoban and also, slightly more conventionally, the works of D H Lawrence. Eventually went back to bed after reading 40 pages. One of the most interesting parts so far has been the evocation of English public school. 'Public school', of course, is a strange term, certainly in the UK, because the schools are anything but public. Attendance at one of these places requires a hefty fee (although there are scholarships for some). Hodmandod Senior went to quite a well-known public school in north London, but he was a day boy. 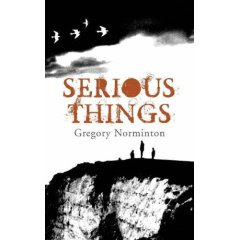 Gregory Norminton, in SERIOUS THINGS, describes life as a boarder. It is a strange combination of the Dickensian (a Main corridor which is a 'Third World hotel of wooden partitions', a red stairwell so that they felt like 'corpuscles in some inner organ or artery') and the carefully selected modern (the floor of this red stairwell is of 'sticky polythene'). The behaviour too represents this dichotomy (long-established rituals of 'fagging' are enacted by boys wearing personal stereos); as does the language of the narrative (the bricks 'proved to be frangible' while the boys tried to 'freak each other out' with talk of the fag test). I remarked on this to Hodmandod Senior at breakfast and he says that is exactly what it was like: the old and the new clashing together: Latin inscriptions disappearing under a palimpsest of penknife graffiti' and at the same time contrails of aircraft cut the sky. There is a very strong sense of foreboding building throughout the first chapter and just before it gets too much the chapter ends and the reader is taken from 'Then' (the mid- nineteen eighties) to 'Now' (presumably twenty years later) when the mature Bruno Jackson unfortunately encounters one of his former school-mates and is therefore reminded of a mysterious (so far) but obviously very unpleasant incident. I love the 'plum-dark eyes' - like Dylan Thomas's 'sloe-black' in Under Milk Wood - but better because the plum also makes me think of a shape that fits as well. Great economy. At the end of this section I know something 'more terrible than anything his wife could imagine' and I am already dying to find out what it is. So on to the chapter called 'Then'. I am just back from an action-packed couple of days in London: coffee with Maxine at the British Library (which passed far too quickly), then over to Marylebone High Street (15 mins at a very fast walking pace) for the launch of Gregory Norminton's book SERIOUS THINGS at Daunt Books which the Daily Telegraph says is the most beautiful bookshops in London. 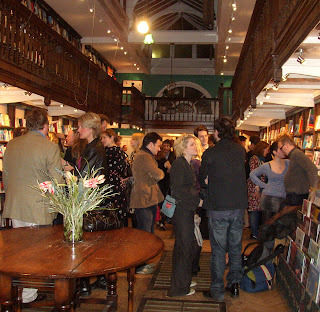 According to the bookmark that was enclosed in my copy of Gregory's book it is an 'original Edwardian bookshop with long oak galleries and graceful skylights'. I particularly liked the balcony, and I wandered up the stairs and for a while looked down on the tops of heads and the golden circles of champagne-filled glasses. After a good time talking to old friends from Sceptre and meeting some of Gregory's old friends from his university days at Oxford, we went on to the Pizza Express where Gregory and his girl-friend Emma had booked a room. I don't know how long this lasted but I had some very interesting conversations with the people near me which continued long into the night at the Groucho Club, eventually getting back to my hotel in the early hours of the morning. However I drank far too much and only remember some of the evening quite vaguely, but it was very good, and I really appreciated the intelligent company. The hotel room was quiet and comfortable (the Presidential again, off Russell Square) and I had an excellent day reading about the religion and folklore of the Navajo. I am finding this particularly fascinating because for previous books I have done quite a bit of work on the Inuit (Arctic) and the Tehuelches (South American) and the Navajo, in North America, fit somewhere between. One feature they all have in common is the shaman. In people that are predominantly hunters there is more emphasis on the individual and the shamen generally have a calling to their vocation; whereas in people that depend on agriculture the healers tend to inherit their role and are trained in their craft, spending many years learning chants. 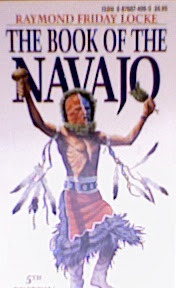 In the Navajo the system is complicated because although they were once hunters they have derived some of their culture from the neighbouring Pueblos who are farmers. So the Navajo have medicine men (and women) who learn chants (or 'Ways') from other experts that cure, but the cause of the illness is discovered from 'arm tremblers' who acquire their insights supernaturally. The medicine of the Navajo depends on the diagnosis and treatment of mental illness. Excellent. I feel a new obsession coming on. The Hodmandods in this household (rather unusually for molluscs) do not favour the cauliflower. Once Hodmandod Senior woke claiming to have had a nightmare about them. I'm not sure what happened to him in this dream but he wouldn't touch a floret for months afterwards. 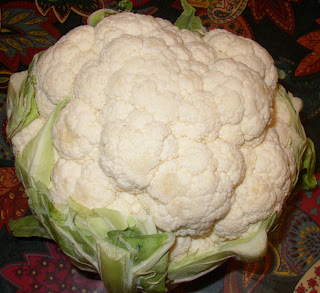 I, however, am quite fond of the cauliflower, especially with cheese, and think them quite beautiful. Another thing that struck me as interesting as I was plunging my knife into this one's hard white little heart a few minutes ago, was that the outer surface consists of fractals. It also reminds me of a brain, a lump of coral, a cloud, a piece of fungus, white paint dispersing underwater, pillow lava seen through red glass, malachite in a dim light and the mashed potato which tonight turned up on the plate next to it. So not a good menu choice. I think Hodmandod Senior is in for another bad night. I have decided to rework my Patagonia book and now deeply involved with the thing again. It is becoming like a former lover you know you should let go and yet find yourself drawn back - the infatuation still there. It is probably not good for me but I am doing it anyway. I am allowing another point of view in the hope that it becomes more involving, and cutting out yet another of my characters. Less is more, I think, even in the field of literature. 'You're not going to rewrite it again!' my mother asks, incredulously. But I am. Four months since I finished the last re-write. Is this the seventh version? I fear that it is - and yet each time I believe (and hope) that it gets better...and I am enjoying every moment. hermetic - complete or airtight or relating to an ancient occult tradition. I knew some of these already but was interested in what they accurately meant. I also found out that the expression 'finding a mote in someone's eye' is when a person finds a fault in someone when their own fault is greater. I didn't know that and had no idea why that expression came to me today, but it did. I have also dipped into this: THE BOOK OF THE NAVAJO by Raymond Friday Locke and intend to learn a lot of more about the Navajos in the next few weeks. This book looks a good place to start because in 450 densely written pages seems to cover the folklore, customs and history. I particularly love to read about creation myths and find it quite thrilling when I see common elements e.g. a great flood or the tree of life and keep wondering if these are collective memories of the end of the ice age or just something that naturally forms itself in the minds of man. 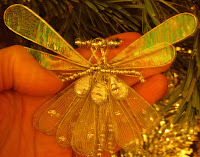 Just as all children go through a stage of drawing a round face with legs attached to represent themselves, so maybe the minds of men go though a stage of imagining a flood or that somewhere there is a tree of life that connects all worlds: the one below and the one above, to our own one in the middle. On Friday I am going to the British Library to find out more. Today, or another day, I saw this: a white seagull against a sky as dark as pewter and for a while, as it wheeled silently against these clouds, it seemed as though it had taken a little piece of my soul and I was up there too, my mind somehow part of his, looking down watching the rest of me, and nothing else mattered, nothing at all. I'm afraid I'm going to have to opt out of this week's since I have spent the last couple of days reading the excellent manuscript of a friend and now have to pack to visit my parents'. 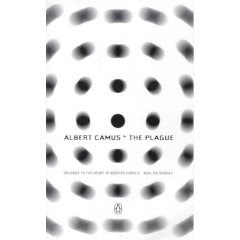 The book I would have read would have been The Plague by Albert Camus. Maybe next week. 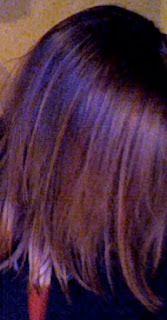 and it goes with my new hair in terracotta and berry). This is an excellent book and I'm so glad I read it. This week I've been busy making notes on each chapter so that I can bring them easily to mind, and find where exactly to find them in the book. 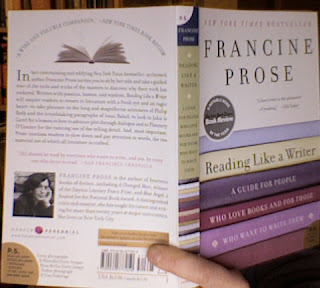 There is just one drawback: Francine Prose's love of reading comes out so strongly that it is infectious. As I read I ordered book after book from Amazon. My TBR pile has now acquired sub-piles and annexes. It is no longer a pile but a TBR village. When my last novel was published in 2004 I was very lucky to be interviewed not only by Jenni Murray on Women's Hour on Radio 4 but also by the rather charming Paul Blezard on One Word Radio. One Word is (or rather was) a digital radio station (and therefore available world wide on the web) entirely devoted to books, but I read just now on Crime Fiction Reader's blog that this no longer exists. It is a sad story and one that Crime Fic Reader tells very well here. Slow reading (which Francine Prose says is good) of the chapter on paragraphs. Paragraphs, by convention, should start with a 'topical' sentence, she says...then she proceeds to show why they often don't. As in all other aspects of writing (and the Arts in general, perhaps) there are no rules, and those that are there are quite often profitably broken. Paragraphs are a feature which are individual to each writer, she says. Then goes on to give examples which indicate slight change of view-point, emphasis, time-frame, end with an action, start with an action and have an action half way through. It's exciting stuff and totally at odds with the advice meted out in a journalism course I did recently - which advised, quite simply, that paragraphs should be of approximately equal length! The chapter on sentences ends with a quote from Hemingway which I like. "Sometimes when I was starting a new story and could not get it going ...I would stand and look out over the roofs of Paris and think, 'Do not worry . You have written before and you will write now. All you have to do is write one true sentence. Write the truest sentence you know.'" Francine Prose then goes on to wonder what is 'true' in this context . She thinks that Hemingway may have, in fact. meant beautiful. But to me 'true' is the most meaningful. If something is true it is beautiful to me. It is accurate but, more importantly, it arouses in this reader an instant of recognition that is like Poincaré's luminescent idea. It's a kind of mental gasp of realisation that means, yes, that's it. That's it, exactly. The rest of the chapter looks at sentence length; how a long sentence can work well, especially when used alongside shorter sentences. She also touches on the importance of rhythm and lyricism and suggests that sentences should be read out loud to check for meaning and cadence. An interruption for aerobics, drinking coffee, laundry (I seem to spend a lot of my time doing laundry), lunch and then I settled down to another chapter. This was about word choice and also about what is left out. I was introduced to several writers I'd not heard of before and have put one of them on my Amazon wishlist (Paul Bowles). It also made me determined to read some Katherine Mansfield. One important choice a writer makes, she says, is naming the characters because this at once conveys the psychological distance. She also says that the 'show not tell' adage is confusing and not always appropriate and gives an example of a passage by Alice Munro which breaks this rules to good effect. 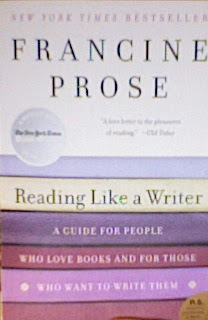 Well I've made my choice: Reading Like a Writer by Francine Prose - a book I first came across through Debra Hamel's blog. I did start reading it last night and liked it. She says that every writer learns how to write mainly through what they read and how they read. She said that a writer notes how a book is written when they read - the voice, the point of view, how the sentences work with each other, the word choice and so on. This, I think is true. I remember discussing point of view with my former agent and she told me that she was never aware of the point of view, or which 'person' is narrating the book (first person, third person, omnicient narrator); she was just aware of the atory. But how a story is written fascinates me and I always take note as soon as I start reading a novel: why choose first person, for instance, or do we follow just one person throughout the book? Another point I find greatly reassuring: she says that, unlike some authors, she never feels she needs to give up reading other people's books when she is writing one herself. Rather, she says, she feels inspired by her reading, and feels it improves her own writing. This is something I've always found myself. She says that if she'd had to give up reading when she was writing (which is, after all, an almost continual process) she doubts she would have been inclined to write that much at all. It's such a great feeling to discover that I'm not alone. The extent of 'the problem'. Here is just a part of my ever-expanding pile of unread books. Although I have indulged myself reading quite a bit over Christmas I do not seem to have made much of an impact. Some I have bought for research for a book of my own, some are books of friends, some are for book group and some are just for pleasure and interest. Looking at them now makes me feel like a child in an old-fashioned sweetshop. I am spoilt for choice. Which one next? I am a lucky woman because I am still in contact with two of my favourite teachers from school: 'Mr Kirk' (I still have trouble calling him 'Martin') who taught me all subjects when I was about 11, and 'Mr Anderson' who I was supposed to call 'John' even at school (it was the progressive sort - which I loved) who taught me 'Humanities' (a mixture of 'Community Studies' and English) when I was about 16. 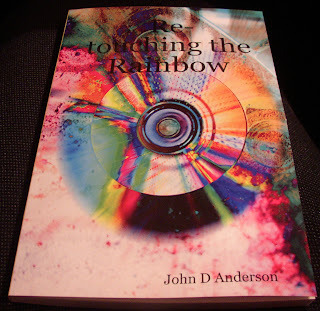 I discovered over Christmas that John Anderson's book RETOUCHING THE RAINBOW is now available from Lulu, so I ordered myself a copy. It came today. I was very interested how a Lulu book would turn out and I have to report that it indistinguishable from a book produced from a conventional publisher. I find this very encouraging. The book is on various aspects of the rainbow - its religious and artistic symbolism. It looks fascinating. I can't wait to read it. The new year is not going well so far. Every day I write a list of things to do in my splendid new diary...and then ignore them. Bad woman. 2.30pm - 6pm: More writing (not sure what I've done since I've come in but had several cups of tea and now know a lot more about the norovirus sweeping the country, the tragic life-stories of people evacuated from the Royal Marsden Hospital fire yesterday and how it feel to be 35 stones and living in Mississippi courtesy of the BBC News website). Actually I did come across some interesting things while I was out so maybe the day was not entirely a waste: for instance, there were so many basketball players practising in the sports hall when I came out of yoga that the pounding of their basket balls and feet made the floor shake quite impressively; then in the supermarket queue I caught myself staring at an elderly man and his middle-aged son whose noses jutted out at exactly the same angle and at one instant lined up exactly in a type of nasal eclipse; and because my yoga teacher told us at the end of the session that no matter how unattractive our exteriors inside we all have the potential to be beautiful (an interesting but not altogether uncontentious view, I felt) I picked out the two most ugly pomegranates I could find in the spirit of sympathy and research, and found that they were indeed quite luscious. I am delighted to report that my weird short story 'Last Day of Summer' is now posted up on qarrtsiluni. Thanks to Marly Youmans and Ivy Alvarez for their excellent editorial advice.